Great so you just bought your child a powerful and beautiful Apple computer which could be the MacBook for College or the iMac at home and using this they could connect with their friends Online, Play awesome games, have video & voice chats and lot more. But before you directly give your child whole access to the new computer its important that from the Main Administrative account you should setup Parental controls following which the child can enjoy all the features but under the limits you have assigned. Lets get started into this features which are offered by the Mac OS X in detail under step by step process. Creating a Child Account : The first and foremost step would be creating and assigning your child a separate user account which would allow him to enjoy a customised homepage along with personal documents folder. 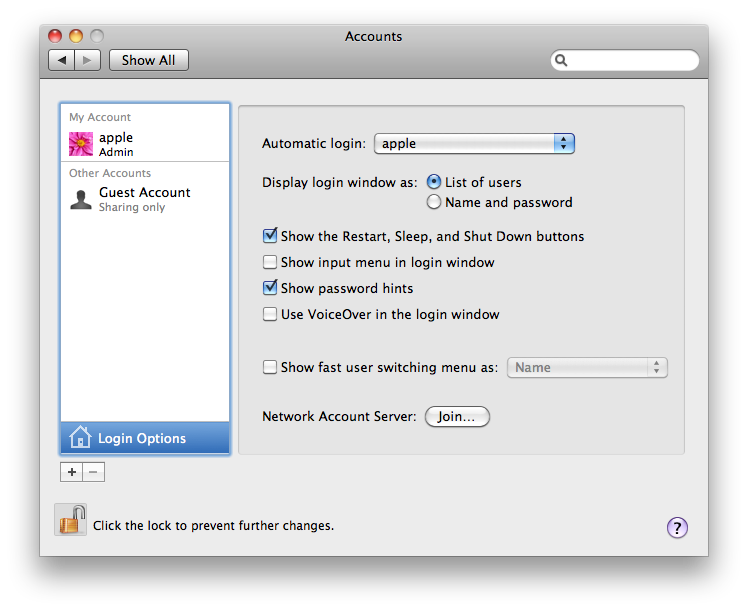 To create this click on the Dock > System Preferences > Accounts > My Account. Next click on the + Sign available at the lower left corner following which you will find a list of forms to be filled. 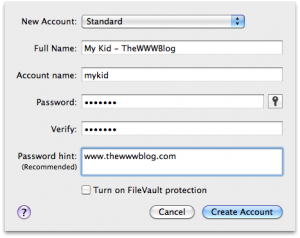 Next you will have to enter the Logins along with the forgot password hint which is useful in case your kid forgets the logins to this new account. If automatic login remains on, you must log out to allow this user to log in to their own account. 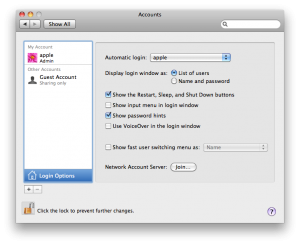 The computer will automatically log in as user “apple” after a restart or shutdown. 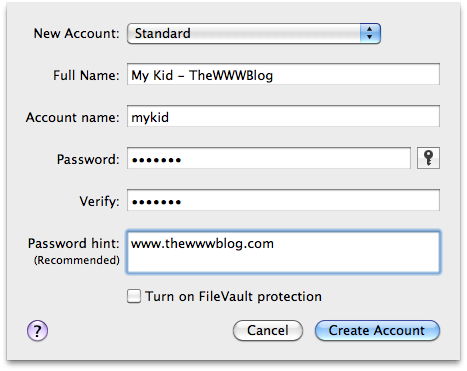 Once you have entered your Child’s name and the password twice followed by hint you will have to click on ‘Create Account’. Once this is done, the new account would be shown under the list of Accounts on the left column. Next click on the ‘Open Parental Controls’ option for this user account by checking on ‘Enable parental controls’ and clicking on the button next to it. You will be given a list of different options under preferences. 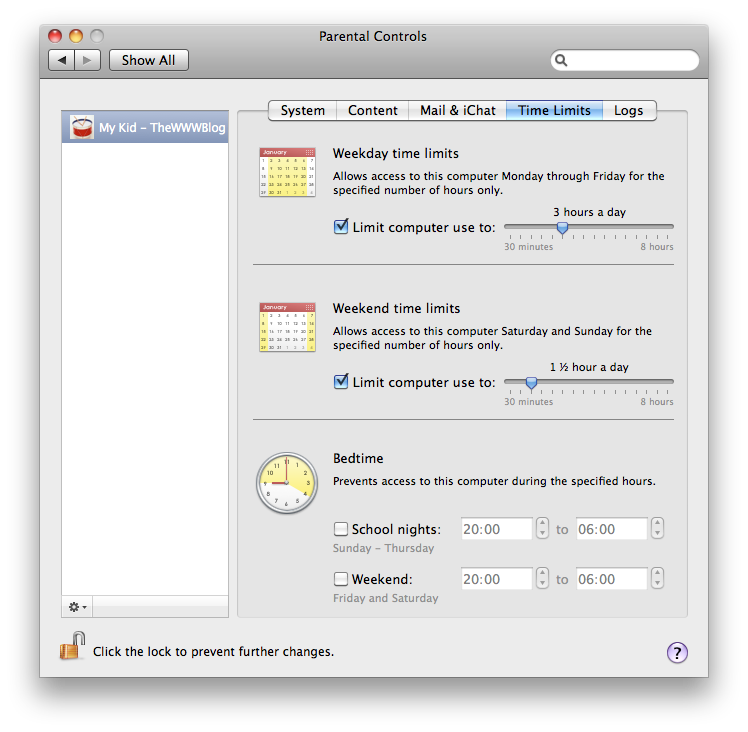 From the left select the child’s newly created account, and then choose the type of control you want to set from System, Content, Mail & iChat, Time Limits & Logs. Click on content and under the Website Restrictions option you can find the options to customize the access to the access of your child to websites of adult or mature content. 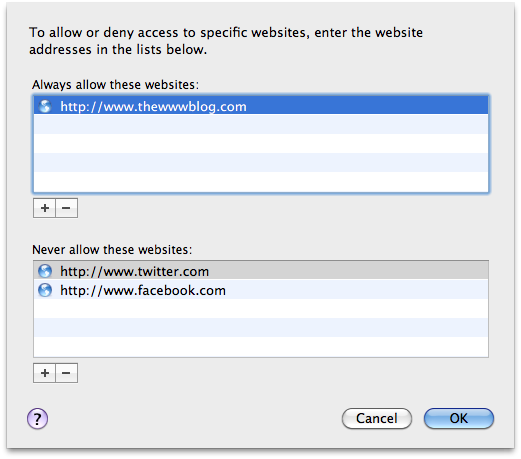 You can under this option allow or deny access to specific websites. 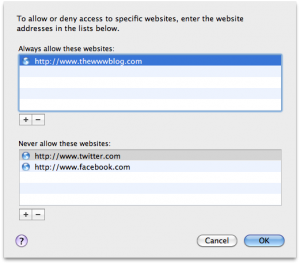 Lets say you want your child not to visit websites like Twitter, Facebook, Orkut, Myspace, Youtube etc then you need to specify all the URL’s here and then press on the Ok button to save these new settings. 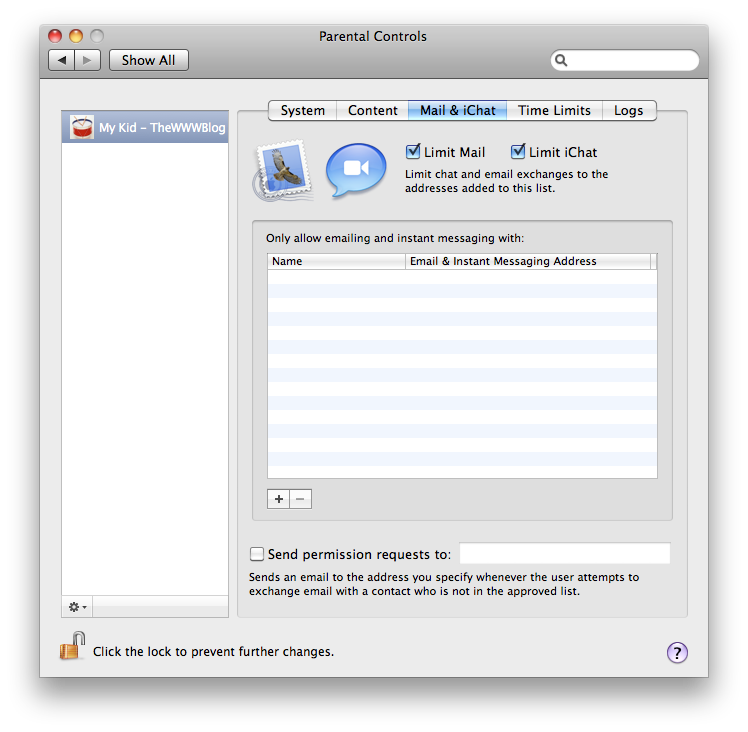 You can also setup restrictions on Mail and Chat under the option and select the Limit iChat or Limit Mail options under which the child wont be able to send mail to anyone except the email accounts you mention there. You need to press the + button to add names and email one by one and allow permissions to send request to. This means that if there is anyone who should be added in this list, you will be sent a email when there is a new add request. The Time limits feature allows you to limit the computer usage on a daily basis and also make sure that once you have set the bedtime, the child cannot access the computer at that time. This makes sure that the login access wont be allowed to enter into the computer and also if the child is already logged in when the bedtime comes up automatically the computer logs out. Finally the logs section offers you detailed information on the history of what your child has performed ranging from showing all the websites he or she has visited to the blocked websites. You can also find all the applications or iChat log from the day to week to a months period. Overall implementing all this stuff can always make sure that your child is secure and his privacy is safe and he is not going to get access to wrong websites or people.